With firm commitment to quality, we are manufacturing and supplying a comprehensive range of 350 M3 Propane Storage Tank. All these tanks are made in accordance with the established norms and standards of the industry. These tanks are made from quality material procured from the authorized vendors of the market and employing modern machines. 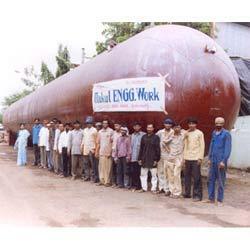 We also offer customized range of these tanks as per the need of the clients. We are pleased to introduce ourselves as one of the leading manufacturer, design, supply, installation and commissioning of LPG Bottling Plants, Auto LPG Stations, Fuel Dispensing Stations, Process Equipments, Rotary Equipments, Autoclaves, Scrubbers, Pressure Vessels, Heat exchangers, Columns, Steel plant processing equipments, Chimneys, Ducting, Heavy Structures, Trailers/Running Gears and General Fabrication in SS and MS material. We are an ISO 9001:2008 Certified Organization, doing the work under major Third Party Inspection such as BVIS, SGS, TUV INDIA, Tata Projects MECH. ELEC. IND; DIL, CMI, Gharda Chemicals etc.